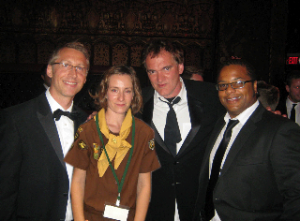 LA, Quentin and the brownies. I first went to Brownies when I was about 6 and I was given a hand me down dress that was a bit big but I was very pleased with. Unfortunately, I was so excited getting ready that I forgot to put my knickers on and then when I got there and realised, I was mortified and refused to play ladders and battleships in case anyone noticed. All the girls spent the next few months thinking I was an unsociable idiot. Fortunately, hindsight is a glorious thing and I learned from this experience. So in LA I wore all the underwear I needed which gave me the confidence to mingle amongst the A-List.